The word dulcimer comes from the Latin dulcis or "sweet" and the Greek melos, meaning "song"or "sound" i.e Sweet Sound. 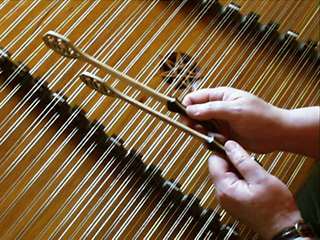 The hammered dulcimer is a stringed musical instrument with the strings stretched over a trapezoidal sound board. 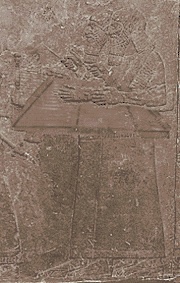 The instrument is typically set at an angle on stand in front of the musician, who holds a small mallet, called a hammer in each hand with which to strike the strings. 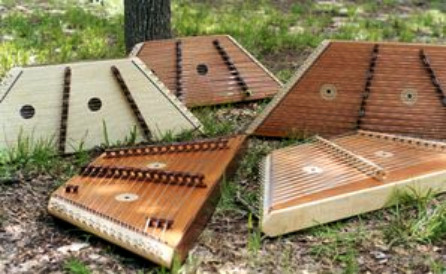 Where did the Hammered Dulcimer come from? The origin of the instrument is uncertain, but tradition holds that it was invented in Iran/Persia roughly 5000 years ago. The instrument was brought to Europe from the Middle East during the Crusades, and similar instruments have spread around the world. In Spain a dulcimer-like instrument is depicted on a cathedral relief from 1184 A.D. Hammered dulcimers were popular in England during the reign of James I, when the Bible was translated into English as the King James Bible. The dulcimer was mentioned in the Book of Daniel 3:5 "Now if ye be ready that at what time ye hear the sound of the cornet, flute, harp, sackbut, psaltery, and dulcimer, and all kinds of musick, ye fall down and worship the image which I have made"
The word in the original Hebrew text is now known to mean something other than "dulcimer"; and it is believed the King James translators were doing the best they could with knowledge available to them at the time. Introduction into the Orient came much later.The Chinese version is still known as the yang ch'in, or foreign zither. Though its use in China is reported to date from about the beginning of the 19th century, Korean tradition claims association with the hammer dulcimer from about 1725. What does a Hammered Dulcimer look like? 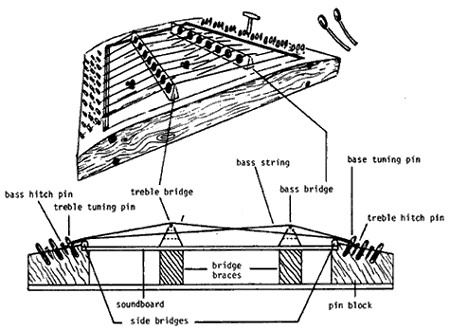 The hammered dulcimer has a trapezoidal-shaped sound box with metal strings running parallel to the long side of the instrument in sets called "courses" of 2 to 4 strings each. The strings are divided into unequal lengths by at least 2 long, high bridges. The first course of strings passes over the right-hand bridge and through a hole in the left-hand bridge. The next course passes over the left-hand bridge and through a hole in the right-hand bridge, and so they alternate all the way up the instrument. This arrangement produces two planes, slightly inclined, that cross each other in the middle (without touching, of course). See the picture above for the general appearance of the instrument. How is a Hammered Dulcimer played? 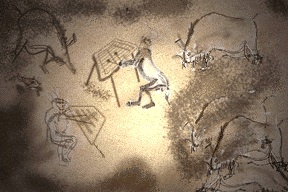 The hammer dulcimer is normally played by striking with small "hammers" They are usually made of wood, but can be made from any material, including metal and plastic. 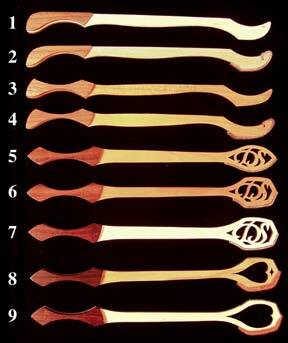 In the Western hemisphere, hammers are usually stiff, but in Asia, flexible hammers are often used. The head of the hammer can be left bare for a sharp attack sound, or can be covered with adhesive tape, leather, or fabric for a softer sound.